"A Christmas Story--The Musical" director Chuck Rogers, and actors Ryan Mattix and Chalmer Harper. 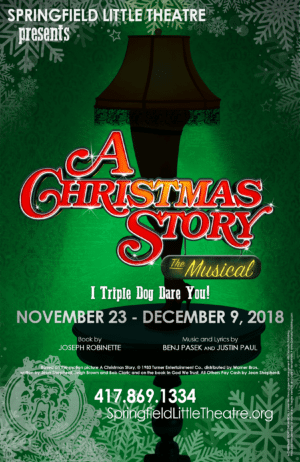 "A Christmas Story--The Musical," based on the popular 1983 movie and the stories of Jean Shepherd, is performed by Springfield Little Theatre at the Landers November 23-December 9. Local theatre patrons may remember the national touring company of “A Christmas Story—The Musical” played at the Juanita K. Hammons Hall a while back. In fact, the national tour BEGAN here at Hammons Hall. But this new LT production is, of course, all local. The other major character is the narrator, who represents author Jean Shepherd’s voice—heard off-screen in the movie, but as Chalmer Harper says, in the stage version he’s not offstage more than two or three times throughout the show. “So I am out there and woven into the tapestry that is the entire musical. It’s really, really fun.” He’s heavily integrated into the stage action. “You start out with Jean Shepherd’s radio show in the heart of Manhattan.” He feels Shepherd, who died in 1999, was “a fantastic storyteller, and just a wonderful radio personality. He was even considered as a candidate for ‘The Tonight Show’” in the late 1950s. (Jack Paar got the job.) “Being on stage to relive all the memories is just a blast,” says Harper. Performances will be Thursdays through Saturdays at 7:30pm, with Sunday matinees at 2:00pm and, starting Dec.1st, added Saturday 2:00pm matinees. Tickets range from $16-$27. For information call the Landers box office at 869-1334 or visit springfieldlittletheatre.org.